A number of valuable resources to monitor drought conditions in Oklahoma are available from state and federal organizations and agencies. The OWRB has served as chair of the Water Availability and Outlook Committee of the state's Drought Management Team since 1996 and regularly publishes the Oklahoma Water Resources Bulletin, the state's official drought monitoring publication, which includes current information on reservoir storage, streamflow conditions, weather conditions, and related factors. To request technical assistance or report a drought or water-related problem, contact us through our online form or call 405-530-8800. 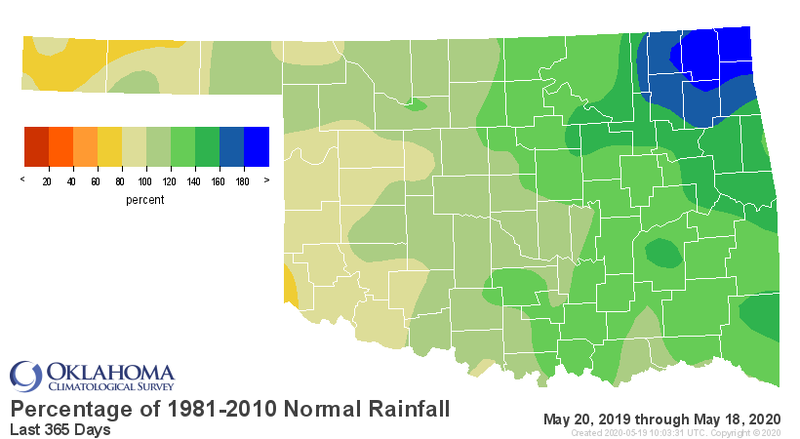 An assortment of drought- and weather-related data is available from the Oklahoma Climatological Survey, National Weather Service, Climate Prediction Center, Western Regional Climate Center and other organizations. NOAA also offers a suite of forecast products. Numerous drought indices - including the Palmer Drought Severity Index, Standardized Precipitation Index, Keetch-Byram Drought Index and Crop Moisture Index - have been developed to provide advanced drought monitoring and assessment information for various purposes. In tandem, these indices not only paint an accurate picture of any particular drought episode, but provide invaluable decision-making tools. Through the OCS website, the Oklahoma Mesonet provides a wide array of precipitation and related information garnered primarily from a network of 120 automated stations located throughout the state. To obtain a general representation of the impact of drought upon the flow of Oklahoma rivers and streams, the U.S. Geological Survey produces a statewide map demonstrating the current seven-day average streamflow compared to historical data. 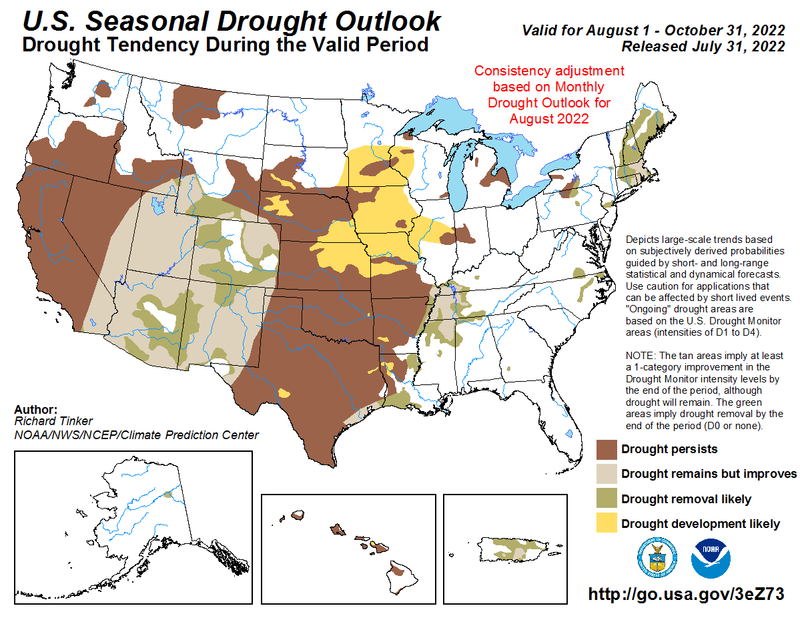 Resulting information indicates areas of the state undergoing various stages of hydrologic drought. All available data for Oklahoma streams can be accessed via the National Streamflow Information Program (NSIP) map viewer. Through the Cooperative Streamgaging Program, the OWRB partners with the USGS, Corps of Engineers, tribes and various local cooperators to maintain a large network of gages statewide that provide priceless real-time and historical data on surface water quantity and quality. Monitoring the general condition of the state's major reservoirs, which can be seriously impacted by prolonged drought episodes, is extremely helpful in identifying emerging surface water supply problems. 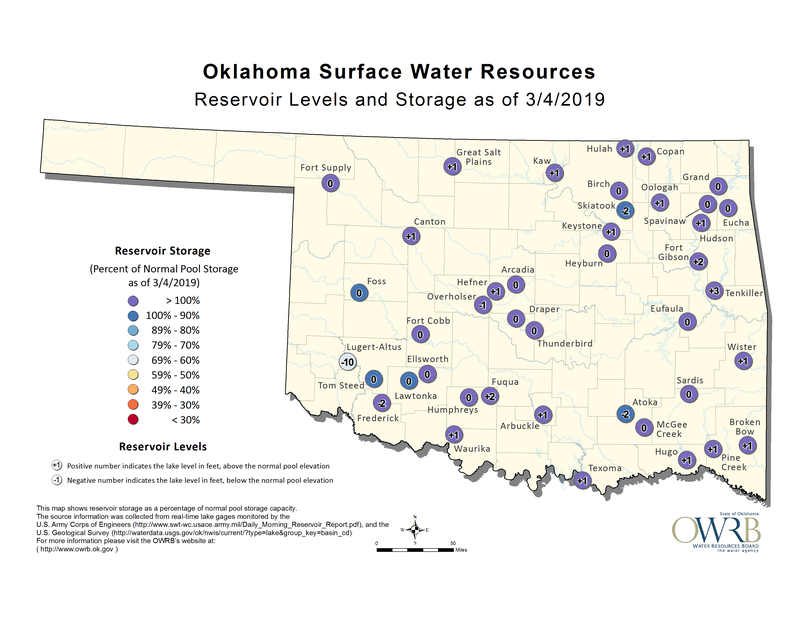 The Tulsa District of the U.S. Army Corps of Engineers and USGS provide real-time lake level and storage information for 49 reservoirs in Oklahoma. The OWRB’s Groundwater Level Map Viewer includes data for 41 water wells (six located at Oklahoma Mesonet sites) equipped with continuous water level recorders as well as some 500 water wells statewide whose depth to water is measured each year through under the agency's Water Well Level Mass Measurement Program. Useful historical trend data is also available for hundreds of wells no longer in the Mass Measurement network. The USGS National Water Information System also contains extensive groundwater data for Oklahoma and the nation. The state's vitally important agriculture is particularly vulnerable to drought. Crop Progress reports are issued weekly throughout the growing season by the Oklahoma Agricultural Statistics Service. The Oklahoma Department of Environmental Quality maintains information on water systems and communities experiencing drought-related and other water problems, including those implementing various local water use restrictions. The OWRB also offers grants for infrastructure-related emergencies resulting from drought situations.